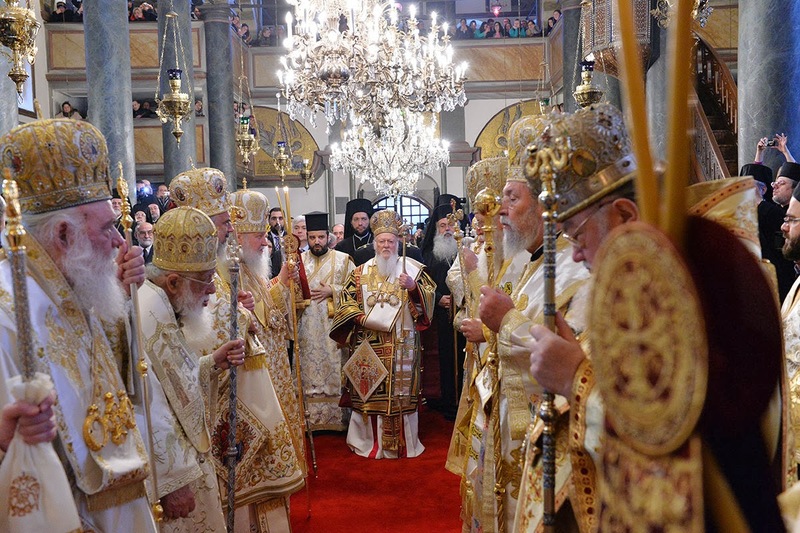 (mospat.ru) - On 9 March 2014, the first Sunday of Lent, the Feast of the Triumph of Orthodoxy, the Primates of the Local Orthodox Churches, who gathered in Istanbul to settle some issues concerning the Pan-Orthodox Council, celebrated the Divine Liturgy at the Cathedral of St George in Phanar – the residence of the Patriarch of Constantinople. His Holiness Patriarch Irinej of Serbia officiated at Matins which preceded the Liturgy. Celebrating the Divine Liturgy were His Holiness Patriarch Bartholomew of Constantinople, His Beatitude Pope and Patriarch Theodoros II of Alexandria and All Africa, His Beatitude Patriarch Theophilos III of the Holy City of Jerusalem and All Palestine, His Holiness Patriarch Kirill of Moscow and All Russia, His Holiness and Beatitude Catholicos-Patriarch Ilia II of All Georgia, His Holiness Patriarch Irinej of Serbia, His Beatitude Patriarch Daniel of Romania, His Holiness Patriarch Neophyte of Bulgaria, His Beatitude Archbishop Chrysostomos II of New Justiniana and All Cyprus, His Beatitude Archbishop Ieronymos of Athens and All Greece, His Beatitude Archbishop Anastasios of Tirana and All Albania, and His Beatitude Metropolitan Sawa of Warsaw and All Poland. Praying in the cathedral were hierarchs of the Local Orthodox Churches, clergymen, and numerous faithful. Among the worshippers were Tsar Simeon II of Bulgaria, Mr. Andrei Karlov, Ambassador Extraordinary and Plenipotentiary of the Russian Federation to the Republic of Turkey, and representatives of the diplomatic corps. During the service, prayers were sung in the Greek, Church-Slavonic, Georgian, Serbian, Arab, Romanian, and Albanian languages. The Message of the Primates of the Orthodox Churches was read out after the Gospel reading. The decisions of the Synaxis and the Message were signed by His Holiness Patriarch Bartholomew of Constantinople, His Beatitude Pope and Patriarch Theodoros II of Alexandria and All Africa, His Beatitude Patriarch Theophilos III of the Holy City of Jerusalem and All Palestine, His Holiness Patriarch Kirill of Moscow and All Russia, His Holiness and Beatitude Catholicos-Patriarch Ilia II of All Georgia, His Holiness Patriarch Irinej of Serbia, His Beatitude Patriarch Daniel of Romania, His Holiness Patriarch Neophyte of Bulgaria, His Beatitude Archbishop Chrysostomos II of New Justiniana and All Cyprus, His Beatitude Archbishop Ieronymos of Athens and All Greece, His Beatitude Archbishop Anastasios of Tirana and All Albania, and His Beatitude Metropolitan Sawa of Warsaw and All Poland. The participants in the meeting made a number of decisions concerning the convocation of the Holy and Great Council of the Orthodox Church. The principle of consensus for taking all decisions during the Council and on various preparatory stages was asserted. The Ecumenical Patriarch will preside at the Pan-Orthodox Council. His brother Primates of the Orthodox Autocephalous Churches will be seated at his right and at his left. Representing each Autocephalous Church at the Council will be her Primate and twenty-four hierarchs at most. The Church which has less than twenty-four bishops will be represented by all her hierarchs. Each Autocephalous Church will have one vote. It has been resolved to convene the Pre-Council Pan-Orthodox Conference in order to adopt all revised documents, as well as the document “Autonomy in the Orthodox Church and Procedure of its Proclamation,” drafted by the Inter-Orthodox Preparatory Commission in December 2009. Two other topics discussed during the preparatory stage – “Autocephaly in the Orthodox Church and Procedure of its Proclamation” and “Diptychs” – are subject to further discussion by the Preparatory Commission. If consensus in regard to these topics is reached they will be submitted for consideration to the Pre-Council Pan-Orthodox Conference in 2015, and later – to the Pan-Orthodox Council. 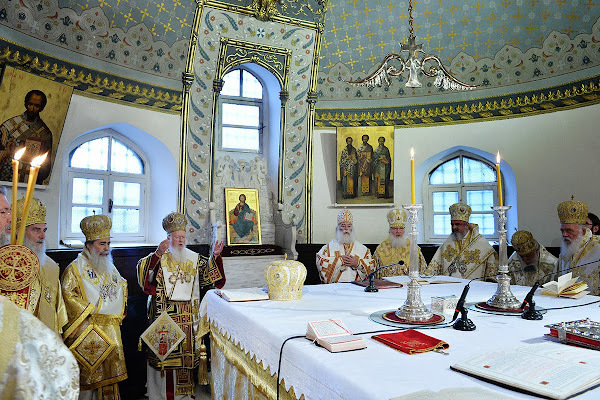 The Holy and Great Council of the Orthodox Church will be convened by the Ecumenical Patriarch in Constantinople in 2016, unless something unexpected occurs. In addition, the Primates of the Local Orthodox Churches resolved to change geographical borders of the episcopal assemblies in North and South America: a separate assembly should be established in Canada, while other countries, except the United States of America, will be included in the assembly of South America. Thus, there will be three assemblies of bishops on the continent: in Canada, in the United States of America, and in Latin America. 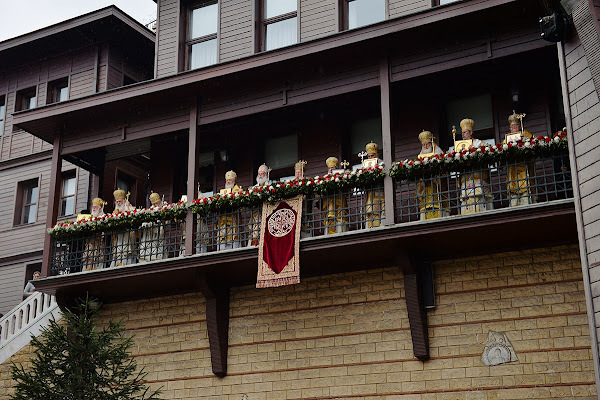 After the Divine Liturgy, a litiya was said for the repose of the souls of all demised Primates and for all who had devoted their lives to the Holy Orthodoxy. The OCA is not autocephalous. And in terms of numbers, the eparchies of the MP are huge compared to the OCA so unwise to ask on the 24 to step down. I don't know. It might make sense to include the OCA's Metropolitan in the delegation of the MP, even give the how huge the MP is. I mean, it's my guess already that ROCOR's Metropolitan will be on the list, but I don't think it's entirely far-fetched that the OCA may be invited.